Relish life with zest and vigor...set your table with Italian gusto! De Medici dots, baroque curves, antique lace, olive branches and wildflowers combine to create Incanto - with revolutionary strength and classic beauty inspired by Italian art and history. It is the unique power of the collection of curves, sculptural forms and varying rhythms that make every piece of Incanto truly unforgettable. Each unique piece complements every other. Incanto means enchanting individuality! All designs are inspired by the maestro artisans' family dinnerware heirlooms of many generations and the best art and architecture of his famous country. 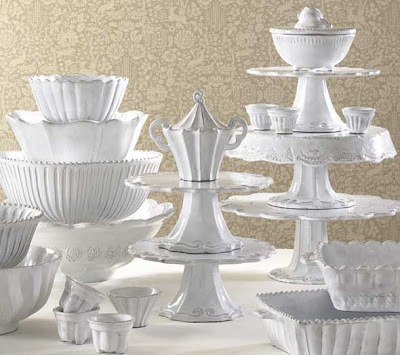 This collection is ideal for mix-and-match - create your own unique setting with over 80 pieces to choose from!